Output Management in the next step of the process - after document creation with M/TEXT, you can now continue processing, optimizing, and distributing documents. Output management processes manage and coordinate functions that serve to provide the addressee with their documents and content in a manner best suited to them: in the right format, via the right medium, at the right time, and at the lowest possible cost. ​Only a powerful output management system can be relied upon to implement and realize detailed personalized customer communication. 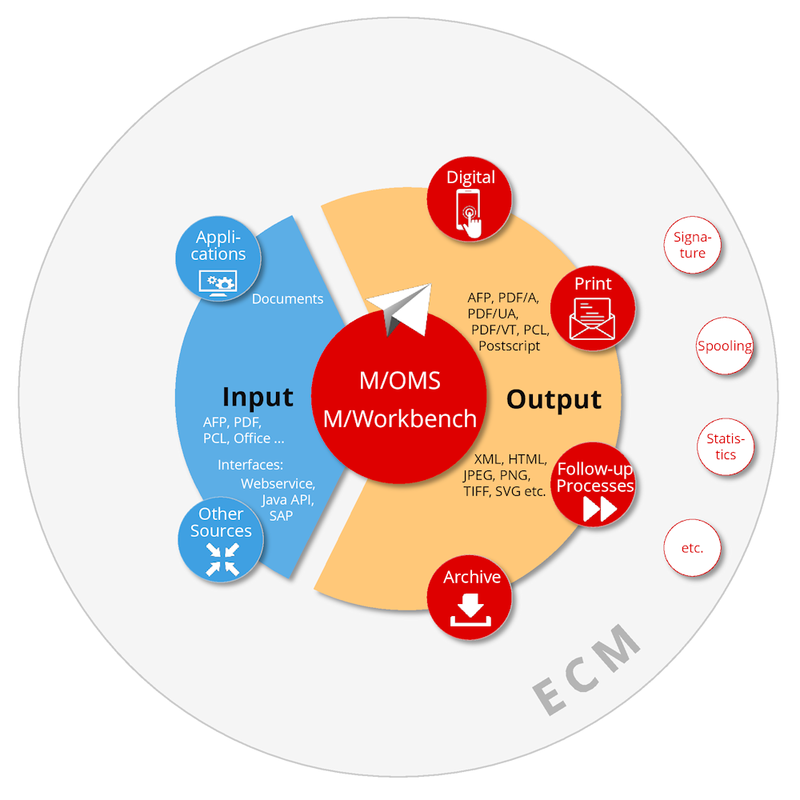 What can you expect from an output management system like M/OMS? ​The best way to ensure an increase in quality, security, and profitability is to process all company documents using a single output management system - from document creation to publishing. 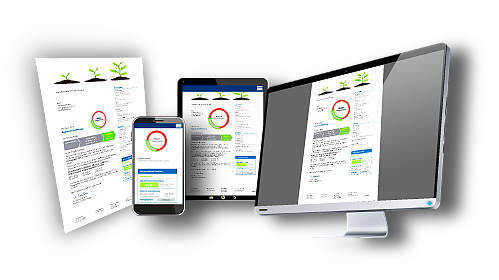 ​Just like our entire M/ Series product suite, our output management system, M/OMS, is designed as a central company solution which carries out all output management tasks for every possible business document across all current output channels (multi-channel). The M/ Series is one of the few systems on the market that carries out the entire document process from a single source - from creation all the way to publishing. It’s a feature that significantly simplifies configuration and project administration. Not only that, the documents are supplied with all necessary data and metadata during the creation process itself. This keeps all options open; at printing time the system can easily decide how the document should look and what its output format is to be. All without laborious analysis or conversion processes. It's often the case that separate systems are responsible for batch processing and interactive or online document creation, that the AFP output requires a different system than that required for PDF output, and so on. The goal is to replace these isolated applications with a single system, a unified output management system. The system is implemented across the entire company and makes use of central resources to produce customer communication of unparalleled quality. Documents that must be created using external systems, for whatever reason, can be easily imported into the M/OMS output management system using input filters. They can then be processed normally with all other documents. In addition to physical and digital output formats, such as print or PDF, it is becoming increasingly more important to utilize additional digital channels, such as SMS or email. This means optimizing documents for viewing on mobile devices. The customer is mobile, and they want their information via a convenient channel. In order to achieve maximum flexibility when processing and producing documents, the M/ Series works with a single universal base document, independent from format. This document contains, from the very beginning, all content, data, metadata, and layout instructions - however, these details remain strictly separated. Only at printing time does the system decide, based on customer information, whether the content is to be output as a letter, an SMS, an email, or saved as a PDF in the customer portal. Finally, the system determines whether the document will be archived, and if so, which keys to use. The only good output management is invisible output management. For a regular document, all the clerk needs to do is click a button to complete the process; there's no other input required. The system takes care of the rest, including production of any necessary documents, plus shipping to the correct recipients. This is why it is particularly important that the administration interface for support teams be well structured, in order to manage the variety of necessary work steps required for the output process. Examples include optimizing shipping costs and shipping, attaching a barcode, controlling enclosures, activating electronic franking, etc. Not only that, at the end of the quarter or year, when processing amounts increase in leaps and bounds, the system must be able to handle these performance peaks using parallel processing, load balancing, and other methods to ensure that there are no delays.